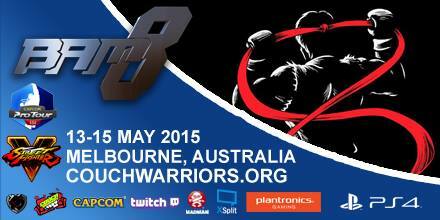 Battle Arena Melbourne will return on May 22, 23 and 24 at CQ Functions, 123 Queen St Melbourne. This is promising to be the biggest BAM yet, as we are expanding the floorspace to take over the entire venue with all three function room spaces. Take a moment to familiarise yourself with the standard rules governing all our tournaments. See below for the specific game settings. Pre-registration for these games is required, on the day sign-up will not be available. Format: Default Timer. Double Elimination. Pools Matches, Best 2/3 Games. Top 4 Matches, Best 3/5 Games. Rules: Double Random Stage Select at all times. Interactables ON. Winner is character and variation locked. Loser may change character and/or variation. Controllers: Wireless Dualshock 4 controllers are allowed. However, the profile for every DS4 must be deleted after every single match. Competitors that fail to do so will forfeit one life if their controller interrupts a match in progress. Details on how to do this procedure is listed below as well as asking your Tournament Organiser on the day. Two Dualshock 4 controllers will be at every station for competitors to use throughout the tournament. PlayStation 3 Arcade Sticks are allowed but will require a Dualshock 4 to be active. The abovementioned rule regarding deletion of the Dualshock 4 profile applies. Step 1: Visit ‘Devices’ in the PS4 Settings Menu. Step 2: Go to ‘Bluetooth Devices’. Step 3: Select the ‘old’ profile/controller and hit ‘X’. Step 4: ‘Delete’ the controller from the PS4. Pot Bonus Prize money to be distributed among top 8. A range of product prizes from WB Games Australia will also be made available. Format: 3 Players per team, A-cho style. 2/3 Rounds, 1 Game, Double Elimination, 99 Seconds, No Handicap, No Edition Select. Rules: A-cho style means teams player A from team 1 fights player A from team 2, player B fights player B, etc. Then the winners fight each other. Blind pick is available for all matches, contact a judge or bracket runner at the character select screen to adjudicate for you, players must stick with a character for a match, but not for the tournament. Teams may have the same character more than once. Ultra Street Fighter IV Teams is available for New Challengers, players who are new to Fighting Game Tournaments, or who have never won a match in a Fighting Game Tournament may enter in a team without paying the $40 Competitor fee, and the highest placing team with a New Challenger will win a seperate prize. Rules: All characters allowed. In a multiple game set, the losing player may change their characters, however the winning player is locked to their characters. Includes Product Prizes from Mindscape Games and Team Ninja. The prize pool will include of a share of the cash entry fees for each tournament entrant. Judges The organiser for SSF2:T is Igor.